Real Clear Sports has just jumped up to my top 5 websites because of this little article. Who’s number one on this list of best entrances in college football? That would be us. That is how you show respect to the definitive entrance to a college football stadium. I watched the video that all of us have seen so many times, and still got chills. Oh what the hell, here it is. It starts with one side of the stadium, “LET’S GO….” And then the other side responds, “HOKIES”. Then the bass line from Metallica’s “Enter Sandman” starts. Fans begin jumping up and down. The band is lined up outside of the tunnel. 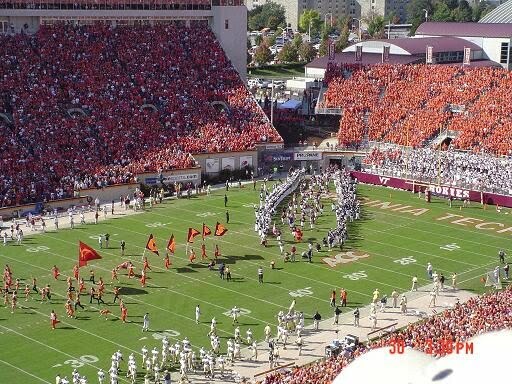 The music hits the crescendo, the team rushes out of the tunnel, the fireworks explode, and Lane Stadium becomes one of the loudest stadiums in college football – and they haven’t even started playing yet. Is there a back-story to this entrance? Probably. But as you jump up and down like a madman somewhere deep in the mountains of Virginia, with Metallica’s bass lines thumping against your brain, ready to watch your Hokies do battle on a crisp fall night, do you care? Probably not. Obviously, with a relatively new song, the tradition isn’t very old, but it has quickly garnered the respect of all college football fans and players as the most intense entrance in college football. We held this one for number one for fear that after you see it you might try and run through a brick wall. This entry was posted on September 3, 2009 at 4:29 pm and is filed under Hokies, Lets Go Hokies, Virginia Tech, Virginia Tech football. You can follow any responses to this entry through the RSS 2.0 feed. You can leave a response, or trackback from your own site. I can't even watch the video, just the description gives me chills. Lets Go Hokies!